If you have been lacking in new beers to try recently well, that is changing this month. With Fresh Beers' inclusion into the Brown Distribution family they can now afford to bring some of the best breweries in the world to South Florida. This month will see the addition of three new breweries with more to follow, shortly. Gold Coast also continues to expand their selection of Sierra Nevada. Here is a little info on all of them. The Bruery is one of the most hyped about breweries out there today and with good reason, they make great beers. I was able to sample a bunch of their different beers last year at Savor in Washington, D.C. I have been saving a bottle of their Saison Rue for a special occasion and now that it will be available all the time, I'm ready to crack it open. Here is some info on all the new beers from The Bruery that should be in stores by next week. And if they aren't, you should demand they get some in. Orchard White is an unfiltered, bottle conditioned Belgian-style witbier. This hazy, straw yellow beer is spiced with coriander, citrus peel and lavender added to the boil and whirlpool. A spicy, fruity yeast strain is used to add complexity, and rolled oats are added for a silky texture. Saison Rue is an unfiltered, bottle conditioned, Belgian/French-style farmhouse ale. This is a beer of subtlety and complexity, with malted rye, spicy, fruity yeast notes, biscuit-like malt backbone, and a slight citrus hop character. With age, this beer will dry out and will become more complex with rustic notes of leather and earth from the contribution of a wild yeast strain. Being a Saison, Saison Rue is ambiguous unto itself as it is a different beer when fresh and when aged. We hope you enjoy it in all of its incarnations. Meaning "rye bread" in Danish, we took our inspiration for this beer from the Danes' staple dark, whole-grain rye bread. Brewed with three types of rye malt, this robust brown ale showcases the earthy, spicy character of the grain, complemented by bready, nutty barley malts and a hint of roast. Loosely based on the Scandinavian Christmas beer or "Julebryg" tradition, this beer is perfect for the colder weather of winter, although it will be available year-round (because who doesn't love a dark beer now and again, regardless of weather?) And don’t worry about the name, we can’t pronounce it either! But we do have a video of us and a lot of others trying our best at http://www.vimeo.com/7504797. Hottenroth Berliner Weisse is brewed in memory of Fred and Sarah Hottenroth, Patrick's grandparents. This tart German-style Berliner Weisse is as authentic as it gets. We used lactobacillus and a hint of brettanomyces to sour this very unusual, low gravity wheat beer. To cut the tartness for those with sweeter tastes, raspberry or woodruff syrup is a traditional way to sweeten the beer. Almost an extinct style, we hope to help revive the Berliner Weisse in memory of two great people. 2 Turtle Doves is the second in the 12 Days/Years of Christmas Services. We decided to take our inspiration from the name and base the beer on the "turtle" candy, brewing it with cocoa nibs, toasted pecans, caramelized sugar and a lot of caramel malts. Somewhere between a Belgian-style Dark Strong Ale and an Imperial Porter, this beer is designed to take the journey through time until 12 Drummers Drumming. If you are from the upper Midwest then you are very familiar with Summit Brewing. They have been brewing in Minnesota since 1986. They are a highly respected and enjoyed brewery. With a lineup that is a bit more accessible to the average beer drinker, that is just starting out on craft beer, this is a good brewery to get them started with. Summit's first-born child and flagship beer, Extra Pale Ale has a pronounced hop flavor and a light bronze color. 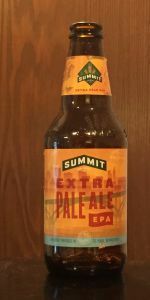 Brewed since 1986, there's not a beer lover in the Twin Cities who isn;t familiar with Summit Extra Pale Ale. Artfully crossing the boundaries of traditional IPAs and Amber styles, Summit created a brew all of their own. Featuring an aromatic blend of Horizon, Amarillo, and Cascade hops with nicely balanced malts for a flavor to enjoy to the fullest. Shiner Beers are part of the Spoetzl Brewing empire and aren't new to Florida but they are being reintroduced after a short absence from the South Florida market. Shiner is to Texas what Yuengling is to Florida. It's that beer that has more taste than your average Bud type beer but not as complex as some other craft beers. They are known for their Shiner Bock but they also have other varieties that will be introduced into the market and they are all quite good. Shiner should be back on shelves by Mid-February but be sure at ask for it if you want to see you local store carrying it. Bock reflects the tradition of genuine Bavarian beers as a brew only a craftsman like Kosmos Spoetzl, trained in the "Old Country," could bring to life. With its deep amber color, distinctive rich flavor and full body, Shiner Bock demonstrates the care of a handcrafted brewing process to bring forth a mellow taste free of the bitter aftertaste found in many micro, specialty, and imported beers. Just thing of it as Shiner smooth. Recalls the classic beer of Bavaria as a true unfiltered wheat brew. This beer captures old-world Munich Malt, wheat grist used in a scant 1% of all brews worldwide, orange, and lemon zest in frothy classic example of bottle-conditioned beer. Adding clover honey and yeast just before it's bottled touches off a unique, secondary fermentation process inside every keg and bottle before its final release from the brewery. Bohemian Black Lager, crafted according to exact old-world standards with imported Czech Saaz, Styrians Hops and selected roasted malt, is the darkest beer they brew. Initially added to the Shiner family as their 97 Anniversary Brew, the unique and complex flavor of this rare brew found such a following among the customers that they brought it back for good. Sierra Nevada is introducing another new seasonal into their ever expanding portfolio. This should be hitting stores any day now. Glissade is a remarkably mellow take on the traditional spring bock. With restrained sweetness, we emphasize subtle malt flavor, balanced against delicate aromas of spicy and floral European hops. This complex balance helps Glissade slide across the palate—bracing us against the last cold nights of winter, while its bright golden color turns our thoughts toward spring. John John Dead Guy Ale is Dead Guy Ale that has been aged in the barrels Rogue uses to make it's Dead Guy Whisky. It should be on shelves now. Ok, yes, I know this is a beer blog but I figured people who are interested in Rogue beers might be interested to know that they also make spirits. These are in South Florida now, so ask for them. Tasting Notes: Delicately sweet with a rich malt complexity, opens up to a warm peppery finish. 6 Ingredients: Dead Guy Whiskey is made with the same 4 grains that are used to make Dead Guy Ale since 1991. Northwest Harrington, Maier Munich, Klages, and Carastan malts; Free Range Coastal Water & Distiller's yeast. 14 Ingredients: Spruce, cucumber, angelica root, orange peel, coriander, lemon peel, ginger, orris root, grains of paradise, tangerine, juniper berries. Champagne Yeast, Grain Neutral Spirit & Free Range Coastal Water. Tasting Notes: Ocean aged in Oregon Pinot Noir barrels resulting in a slightly fruity, mellow and definitely Pink Gin that could only come from Oregon! 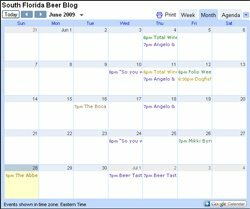 A lot more breweries coming to South Florida shortly... Southern Tier and some others. As soon as I know when, I'll let you know. Shiner is to Texas what Yuengling is to Florida. Isn't Yuengling brewed in Pottsville, PA? I don't get the comparison, but then I'm not the beer expert. I meant it more in the popularity of Shiner in Texas is like the popularity of Yuengling in Florida. Not in where they are brewed. Thanks for all the coverage also.